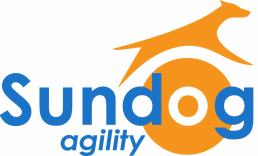 Sundog Agility was established in December of 2014, but not officially starting until January of 2015. It is a combined effort between Amanda Labadie and Cindy Barkley. Sundog was created because there is a great need in our area for somewhere for people to go to have fun with their dogs. Us included! Agility is a fantastic sport, and whether you are getting involved just to do something fun with your pooch, or you want to make it in the big leagues- we hope to be able to offer you something! We want everyone to be able to play, and enjoy this great game! See Below for individual bios for Amanda and Cindy, and click here for Sundog Instructors! "I have had dogs all my life but the first time I saw agility was in about 1998 when I took my son to an agility class with Bronx a Cardigan Corgi. It was there that I first met Amanda who was only a couple of years older than my son. Time went by and it wasn’t until the fall of 2009 that I took my first step into an agility ring. Wow what a rush and I was hooked immediately. I live with a pack of 4 very different dogs. My oldest and alpha dog is a Cardigan Corgi Sunar, two Kelpies Pike and Mudd, and a little rescue Pembroke Corgi Rocky. In 2012, both Sunar and Pike came up with injuries from agility so we took time off to heal and re-assess. Together Sunar and I learned the game of agility so she is very special to me. I still have lots to learn and look forward to training my Kelpies for this awesome sport. I am super excited about Sundog Agility and am blessed with a fantastic partner Amanda. I look forward to the future of training and playing with dogs and sharing this joy with a great bunch of people with the same vision. " "I have been involved in dogs for more than 15 years. And most of that involves Agility. I started training my own dog in the early 1990's and things sort of grew after that. The very first time I saw agility was when I was 12 years old. I was at a workshop that allowed us to sample all different kinds of dogsports. I remember being just amazed, and was hooked from that point on. Agility has come a long way since then, as have I! Aside from Agility, I also have a dog training business that focuses on Obedience, Rally, and Behaviour. I love teaching people, and helping dogs. Currently I am owned by 6 dogs. Each of them have taught me something- some patience, some understanding, when to push, when to give, and how to problem solve. I have competed at the Regional, and the National level- my little corgis ran their hearts out for me. Unfortunately their bodies just couldn't keep up with the strain of such an active sport and both were retired young due to injuries. In 2012 I took a hiatus from agility, and it took until now for me to have the heart, and the help to come back to this great game. Now I am training a young Border Collie, and am looking forward to many years of teamwork with him. Sundog is a dream come true for me, and I am just so excited to have this opportunity. It's going to be great, I can feel it!"